Other number 352 Handwritten on the cover. The object is a set of 10 germanium transistors originally packaged in molded styrofoam inside a cardboard sleeve. These transistors were used in hearing aids. "germanium PNP alloy junction subminiature transistors, in original bulk packaging. Raytheon’s initial success with germanium transistors was based on the large scale production of hearing aid transistors. 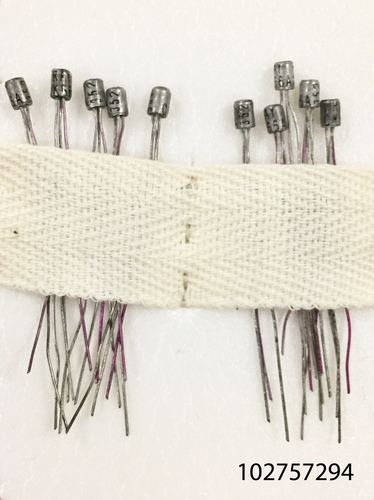 In this application, miniaturization was an important requirement, since smaller components would result in smaller finished device hearing aids. As early as 1956, Raytheon was manufacturing miniature transistors which were sold in large quantities to hearing aid companies. Raytheon continued to reduce the size of specific transistor types, and introduced the “subminiature” case style in 1958. These submini transistor types did not have a long term impact on the electronics industry, including computer circuits, since integrated circuits began to appear by the early 1960s and were the primary technology driving the miniaturization of semiconductor devices. Date code: 352 (1963, week 52). 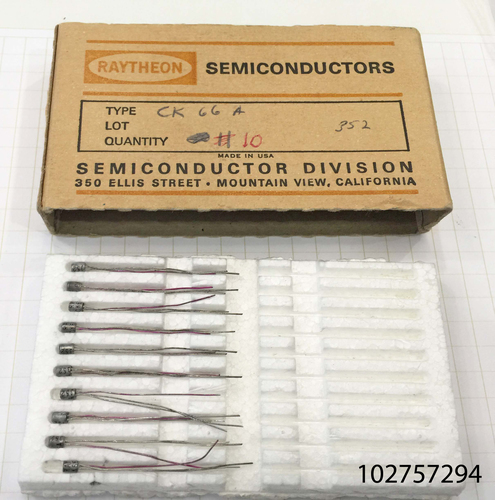 Rare to Common - although many tens of thousands of Raytheon subminiature transistors were produced in the late 1950s/early 1960s, it is rare to find these in original packaging."